“The Art of Reality (DS)” was originally posted on November 29, 2009, 9 years ago. The inspiration behind this Dream Sequence was a 15th century triptych oil painting on oak by the studio of Dutch renaissance painter, Hieronymus Bosch. It is said the tri-paneled painting was intended to be an altarpiece, and as such, had been given no identifying title or official name at the time of creation. 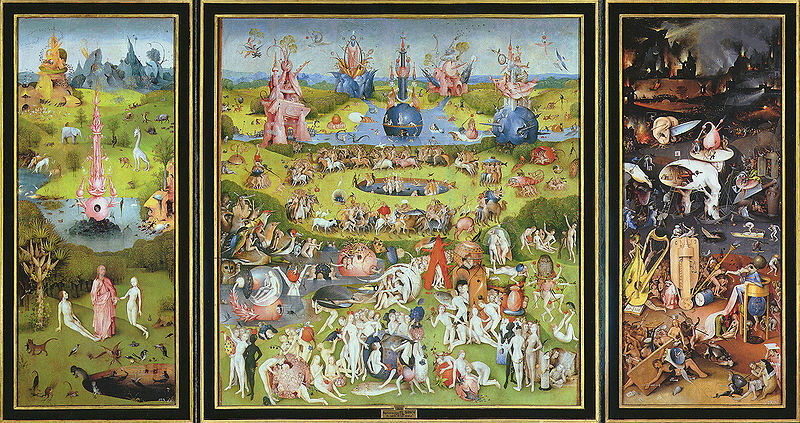 Over the course of the last five centuries, this masterpiece has been known by a number of names; today we call it, The Garden of Earthly Delights. 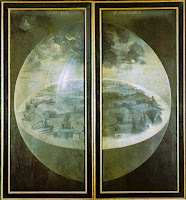 Being visionaries in our own way, we took great delight in Bosch’s visionary and relevant interpretation of the cycle of earthly life, displayed like a book of murals to be read on the wall from cover to cover. 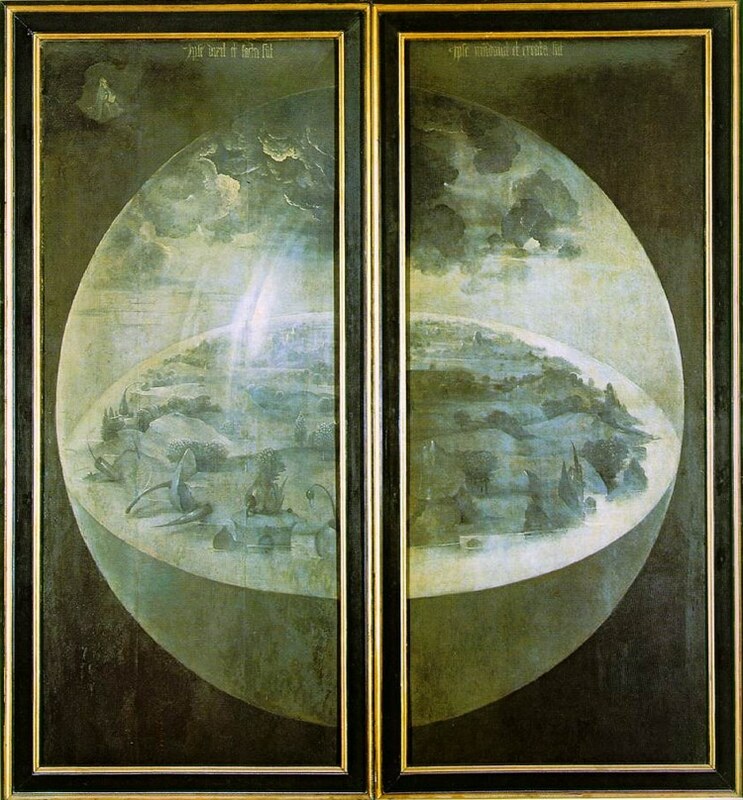 The story of life as depicted by Bosch begins with the outer panels -the book covers, if you will- which offer us a monochrome vision of what appears to be a holographic global flat earth and firmament dome, giving us the story’s setting. Like reading a book from left to right, we begin with the left interior panel showing what looks to be Eden or Paradise (representing birth, creation, innocence). The large center panel illustrates in intimate and intricate detail what we might consider the passions and temptations of life within that Paradise (representing bliss, indulgence, revelry, communion). The story then concludes with the right panel and the notion of Paradise lost (representing last judgment, wretchedness, separation from the divine). To us, this perceptive masterpiece reads like a modern day reality show. Courtesy of Operation Mockingbird, one look at the imagery of a current edition of any mainstream media news/entertainment outlet says it all. Reality is in the eyes of the beholder. It’s a very individual thing. How to answer this question would depend upon one’s perspective because in the end, our interpretation of reality comes down to our personal perspective. And perspectives, like beLIEfs, can be indoctrinated. They can be programmed, controlled and manipulated by external influences. And they can also change when challenged. Our entire world can transform forever when we embrace a new perspective. Whether the catalyst for change comes from listening to the whisper or from feeling the brick is somewhat irrelevant to the lasting impact it has on one’s personal perception of their reality. Everything may look the same on the outside, but nothing is the same on the inside. And that changes how we perSEEve everything. Most shifts in reality are a direct result of some form of Consciousness Quake. What we really want to know now is could Bosch’s third panel portrayal of what many beLIEve to be a nasty afterlife instead be the behind-the-scenes underbelly of our present-day reality, with the center panel façade acting merely as the illusionary projection screen? Which brings us to the deeper question going forward: Was Bosch trying to show us that our world is a holographic simulation? 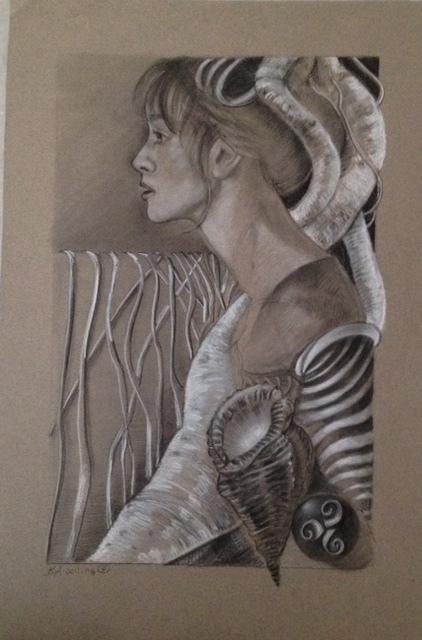 © Copyright by Artist, KAd Collins. Druid Goddess. 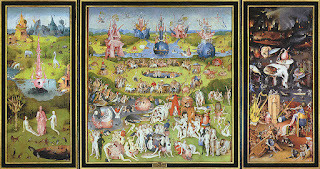 We had a dream......and in that dream we found ourselves strolling through the surreal terrain of Dutch renaissance painter H. Bosch in “The Garden of Earthly Delights,” and felt as though we were immersed in a modern reality feature film that only Tim Burton could direct. Our voyage through this intoxicating dreamscape plunged us without thought of consequence deep into a world of art imitating life imitating art. To a place where we were incapable of separating fact from fantasy, for the reality is that there was no difference. And like every true pageant of the masters where a two dimensional painting is brought to real life, we watched like voyeurs as the indulgent derangement of earthly pleasures before us morphed into a third panel reality war zone. The reality wars being waged within our dream were inescapably dominated by the Balloon Boy posse and the D.C. No R.S.V.P. party crashers. We were rendered speechless as both competitors deliberately left in their wake a smoldering third scene battlefield fully decimated by outrageous exploits – all dramatically delivered with the flamboyance required of a successful reality show audition. A couple sets of felonious fingerprints were left behind in the scorched earth as well, with perhaps a couple more to follow. Apparently in the real world, the end is meant to justify the means. This ostensibly translates for many to mean no rules, no boundaries, no limitations, no dignity and usually no talent. So when we see that big reality bull burst into a stampede through the china closet of innocent bystanders and carelessly shatter lives and livelihoods while screaming “me, me, me!”, we’ve bizarrely come to accept that even bad publicity is still publicity. Well, psychology 101 has long asserted that negative attention is better than no attention at all. Yet to repetitively reward the bad behavior of attention grabbers with the media attention they're aggressively hungering for has not only helped create a ravenous monster always starving for attention, but has unquestionably sustained it. 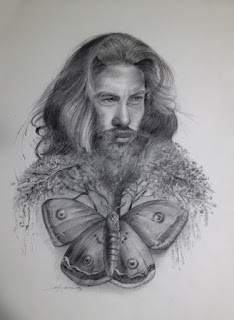 As narcissism continues its incessant me-parade across our high definition screens, and Pavlovian conditioning reinforces the belief that anything and everything goes in the insatiable quest for notoriety, we can only wonder when going too far will just be going too far. And then we woke up and realized that Bosch’s vivid, yet surprisingly realistic, illustration of life’s temptations and the human condition has lost no relevance with the passing of time and civilizations. Can we reasonably expect the master’s real life garden of earthly delights to remain as relevant in the coming centuries as it is today?